Access physical activity grades, report cards and other related documents from all Global Matrix events in which Chile has participated. To develop a national surveillance system on physical activity for all ages integrating the social determinants of these behaviours. To implement systematic and pragmatic evaluation of budget distribution and investments in different ministerial sectors to facilitate physical activity in all policies. To install the right to play as a highly relevant tool for promoting comprehensive development of a society not only in schools, but all settings. 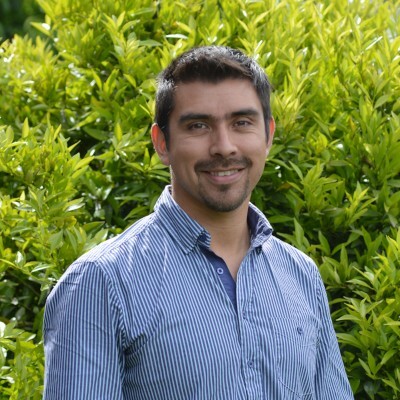 Nicolas Aguilar-Farias, Ph.D.Nicolas Aguilar-Farias is Assistant Professor at the Department of Physical Education, Universidad de La Frontera, Chile where he leads the UFRO Activate Research Group. He holds a Bachelor degree in Physiotherapy (UFRO, Chile) and Master degree in Clinical Exercise Physiology (UQ , Australia). He has recently submitted his PhD thesis at the University of Queensland, Australia. He is a member of the education and communication committee of the International Society for Physical Activity and Health (ISPAH). Member of expert commitee in the new Physical Activity recommendations and Physical Activity policy for Chile. Nicolas is leading a range of studies in Chile, in collaboration with researchers both nationally and internationally. His recent work has been focused on improving and evaluating measuring tools for physical activity and sedentary behaviour in different age groups. Also, he is currently measuring determinants of physical activity in children and older adults in ethnically diverse populations. His research group and national network is starting the assessment of the Ciclorecreovias (Open streets), and built and social environment as physical activity facilitators or barriers in Chile. The website for Chile’s report card is: www.chileactivate.com. Nicolas Aguilar-Farias, Pia Martino-Fuentealba and Andrea Cortinez-O’Ryan, on behalf of the Chile’s Report Card Research Work Group. Background: The 2018 Chile’s Report Card on Physical Activity for Children and Youth is a review of the evidence across 13 indicators of behaviors, settings and sources of influence associated with physical activity (PA) of Chilean children and youth. Methods: A Research Work Group reviewed available evidence from publications, surveys, government documents and datasets to assign a grade for PA-related indicators based on the percentage of compliance for defined benchmarks. The 2018 Chile’s RC included the 10 core PA indicators that are common to the Global Matrix 3.0: Overall Physical Activity, Organized Sport Participation, Active Play, Active Transportation, Sedentary Behaviors, Physical Fitness, Family and Peers, School, Community and Environment, and Government. Additionally, we have included 3 additional indicators: Sleep, Inclusion, and Overweight and obesity. An A was defined as 80-100% of children accomplishing a given benchmark; B: 60-79%; C: 40-59%, D: 20-39%; F: 0-19%; INC is Incomplete data availability to assign score. Results: Grades assigned were for i) ‘Behaviors that contribute to overall PA levels’: Overall PA, D-; Organized sport participation, D-; Active play, INC; and Active transportation, F; ii) ‘Factors associated with cardiometabolic risk’: Sedentary behavior, C-; Overweight and obesity, F; Fitness, D; Sleep, INC; iii) ‘Factors that influence PA’: Family and peers, F; School, D; Inclusion, INC; Community and built environment, B; Government strategies and investments, B-. Conclusions: Overall, Chile’s grades remained low compared with the first RC. On the positive side, Chile is advancing in environmental and policy aspects. Attention should be paid to promote active transportation and support families and peers to promote PA. Our findings indicate that the implementation of new strategies should be developed through collaboration between different sectors to maximize effective investments in increasing PA and decreasing sedentary time among children and young people in Chile. Nicolas Aguilar-Farias, Andrea Cortinez-O’Ryan, Kabir P Sadarangani, Astrid Von Oetinger, Jaime Leppe, Macarena Valladares, Teresa Balboa, Carolina Cobos, Nicolas Lemus, Magdalena Walbaum, Carlos Cristi-Montero. 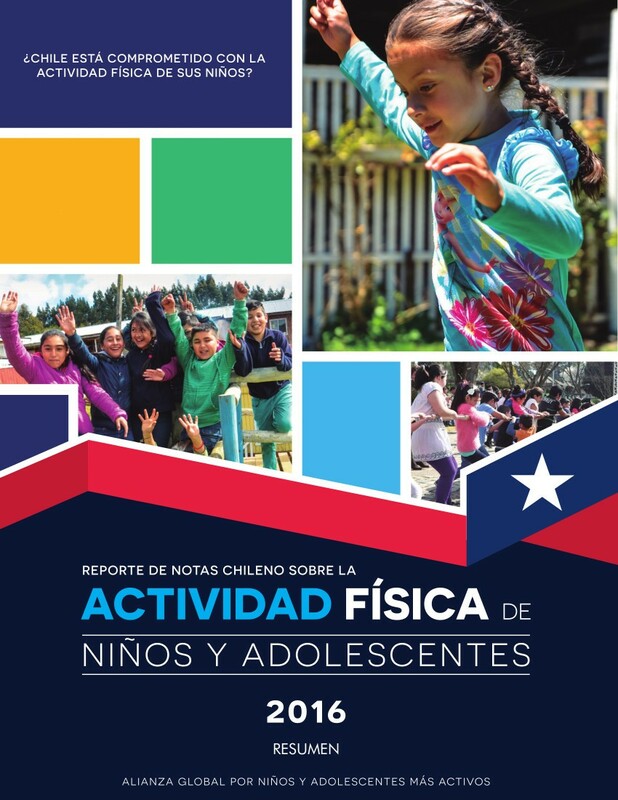 Background: The 2016 Chile’s Report Card on Physical Activity for Children and Youth is a review of the evidence across indicators of behaviors, settings and sources of influence associated with physical activity (PA) of Chilean children and youth. Methods: A Research Work Group reviewed available evidence from publications, surveys, government documents and datasets to assign a grade for 11 indicators for PA behavior based on the percentage of compliance for defined benchmarks. An A was defined as 81-100% of children accomplishing a given benchmark; B: 61-80%; C: 41-60%, D: 21-40%; F: 0-20%; INC is Incomplete data availability to assign score. Results: Grades assigned were for i) ‘Behaviors that contribute to overall PA levels’: Overall PA, F; Organized sport participation, D; Active play, INCOMPLETE; and Active transportation, C-; ii) ‘Factors associated with cardiometabolic risk’: Sedentary behavior, D; Overweight and obesity, F; Fitness, F; iii) ‘Factors that influence PA’: Family and peers, D; School, D; Community and built environment, C; Government strategies and investments, C. Conclusions: There is a major challenge for improvement as most PA indicators scored low. There were clear research and information gaps that need to be filled with the implementation of consistent and regular data collection methods.